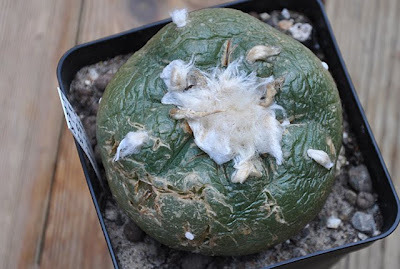 I'm keeping my plants completely dry during their winter dormancy and consequently they are rather flaccid come spring. 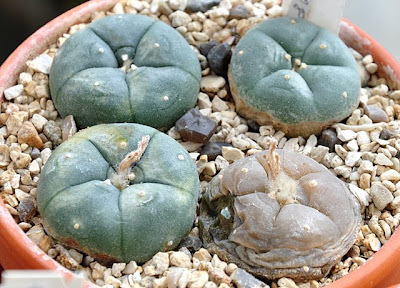 The following time-lapse video shows a couple of my larger Lophophora diffusa plants growing turgid after having their first drink of water in several months. In a fit of thoughtlessness I also watered the Bowiea volubilis visible in the background. 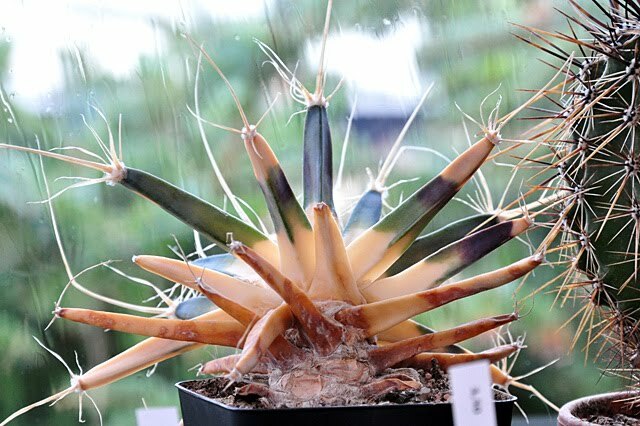 This plant also started to expand generating visual “noise” that makes it harder to see exactly what moves when and where. 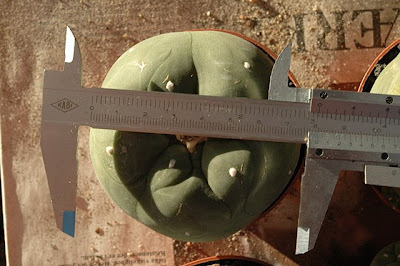 To amend this mistake I inserted the white markers that act as fixpoints showing how much the cactus will have expanded by the time the video ends. The pictures used for the time-lapse video were taken over a period of 88 hours starting March 6, 2009 in the afternoon through March 10 in the morning. A picture was taken every 15 minuttes giving a total of 352 photos; these are played back at 24 frames per second resulting in a video lasting slightly less than 15 seconds. Another piece of technical trivia is that each second of the time-lapse video corresponds to 6 hours real-time. The pictures used for the high-definition (1280x720) version of the video above were cropped to obtain the 16:9 aspect ratio. A time-lapse video based on the uncropped and unmanipulated photos (without white markers) is shown below. The swelling of the plants is not as evident as I had hoped for so I might try doing another “swelling with water” time-lapse video again next year – this time starring some of the plants from my coldhouse (as they are drought dormant for a longer time than my windowsill grown plants). 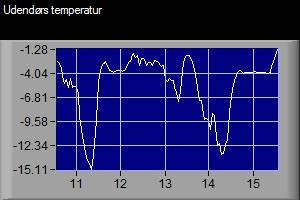 Also the flickering, caused by the shifting light conditions during the day, is a bit disturbing. If I do a video like this again I'll see if I can avoid ambient light completely. 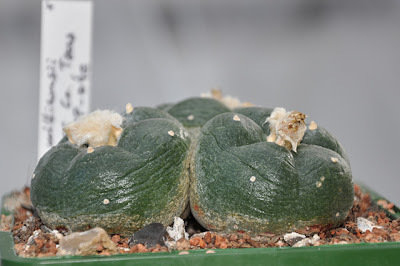 The plant was bought just a couple of months prior to these pictures being taken, as described in my post on a Lophophora bargain. 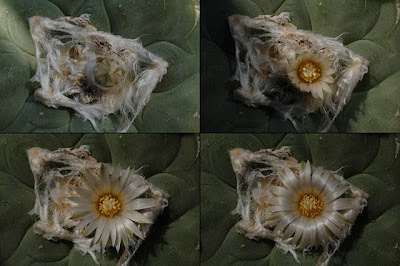 You can now watch the flowering Lophophora diffusa in blazing high-definition ;-) I cropped the photos used for the time-lapse video to a size of 1280x720 in order to make the 16x9 HD movie shown below. 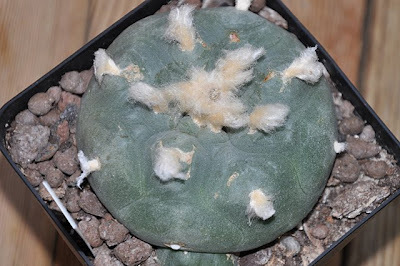 Several of my plants are flowering right now, including many of the large undetermined Lophophora plants I bought earlier this spring. 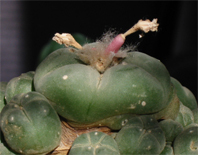 The plants were sold as Lophophora williamsii but body morphology and flower color suggest that many of them are actually Lophophora diffusa. 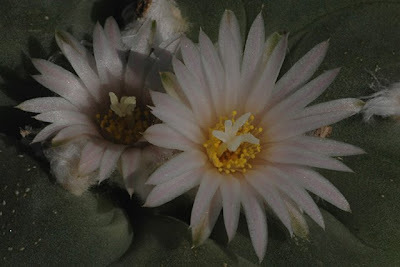 Even though they flower, it is still difficult to determine the species of some of the plants conclusively, so I suspect them to be of hybrid origin. 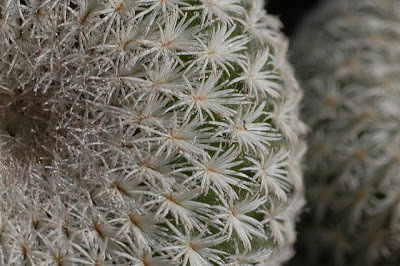 A handful of flower photos are included below. 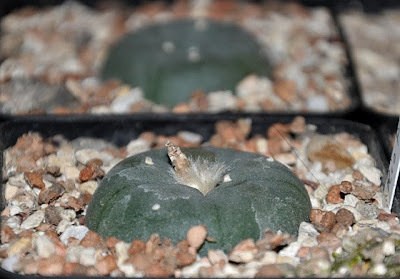 As mentioned in the previous post on Ariocarpus and Epithelantha I have experimented with coldhouse grown Lophophora since 2004. 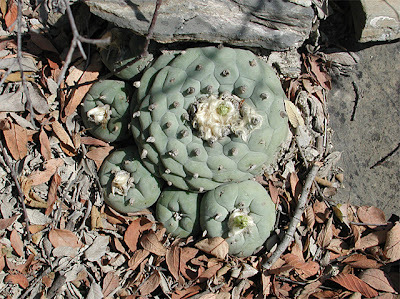 The Lophophora williamsii (SB 854; Starr Co, Texas) plants from the 2004 batch are still doing great. 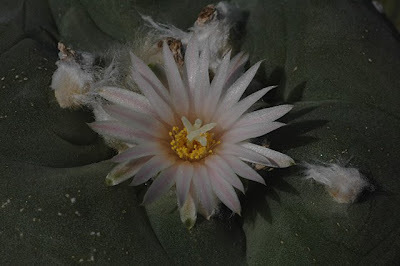 The plants are growing true to the type with a glaucous bluish-green epidermis. The one on the left flowered last year so I'll soon be able to produce seeds originating from plants that have survived several seasons in an unheated greenhouse. 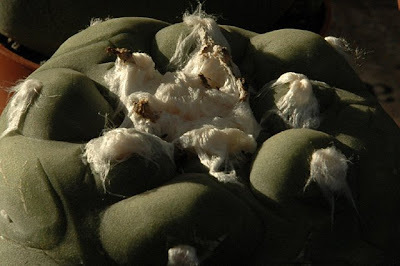 During winter all my Lophophora plants are wrapped in horticultural fleece - both as a protection against the cold but also to keep out hungry pests. 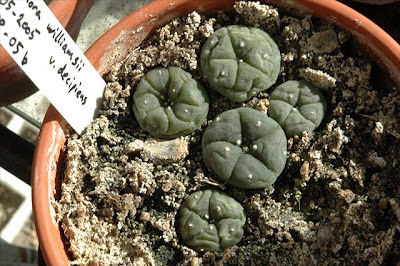 Some of the plants needed to be repotted before the upcoming growing season, for example these Lophophora williamsii (SB 854; Starr Co, Texas) plants from the 2005 batch. 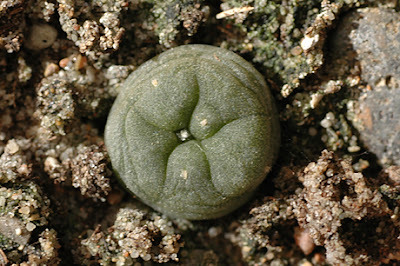 The plants started from seed in 2005 have grown to 2.5 - 3 cm (~ 1'') in diameter - with a bit of luck they might flower already this summer. 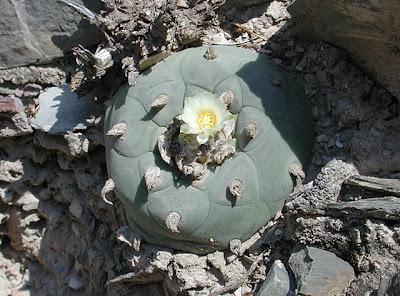 I never cease to be marveled by how large a fraction of a Lophophora plant that is actually growing underground. 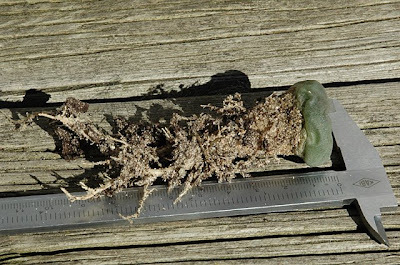 The plant pictured below has a crown that is approximately 1 cm high while the massive part of the taproot amounts to 4 times that and the full root system is more than 10 cm long. 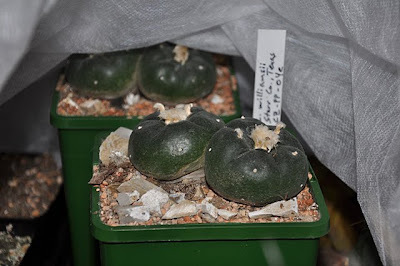 The past winter was mild - the coldest temperature registered inside the coldhouse was -5C (23F) - so even my Lophophora diffusa and Lophophora decipiens plants have all survived without any signs of damage. 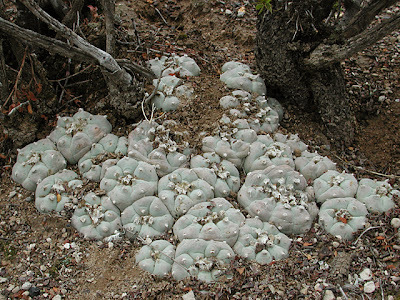 The Lophophora decipiens plants are very shriveled and look in dire need of a drink of water. They'll have to wait for a couple of more weeks in order for the weather to warm up. Last year I grafted a handful of Lophophora williamsii (SB 854; Starr Co, Texas) seedlings on frost hardy Opuntia compressa (Monmouth County, New Jersey) stock. 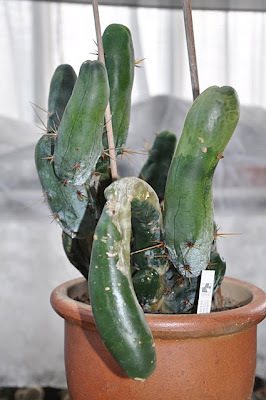 The grafts seem to be doing well and I'll get back with more information on Opuntia grafting when I've done some more experiments. 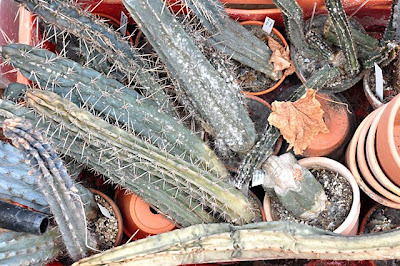 When visiting garden centers and flower shops I'm always checking out their cacti and succulents to see if they have any interesting plants. Usually they don't. 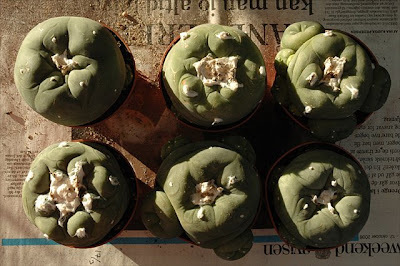 This Easter my girlfriend and I were browsing a garden center looking for common hollyhock (Alcea rosea) to plant at our summerhouse when I eyed a trayful of Lophophora plants. 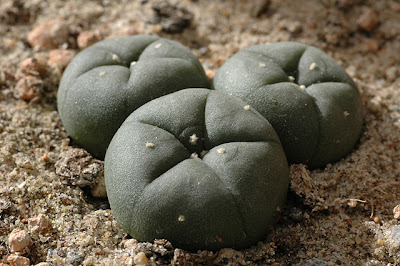 The plants are quite large, 7.5 - 8 cm (~ 3'') in diameter, and are looking a bit bloated; they don't have the ancient, mature look and feel you would normally expect from plants this size. Despite their youngish appearance the plants are old enough to be sexually active (many have flower remains peering out of the wool). 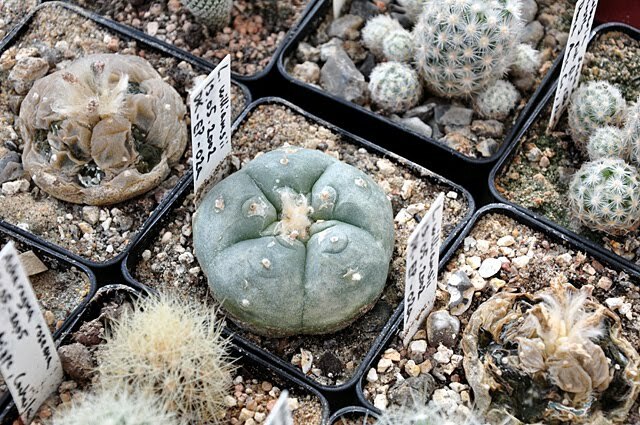 I don't think the garden center exactly knows what they are selling. 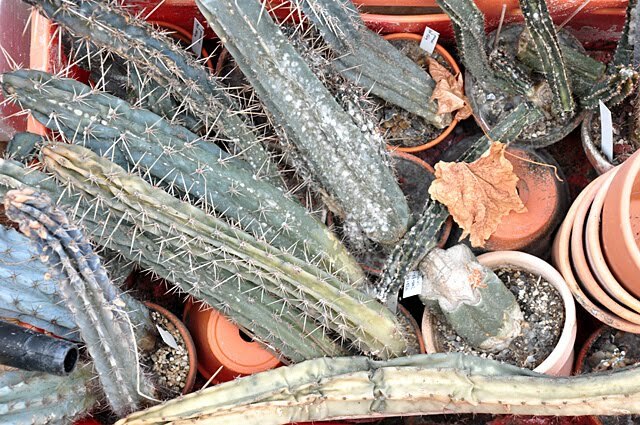 The plants are mislabeled as "Lophophera williamsii" and when asked the people at the center had no idea where the plants were produced. 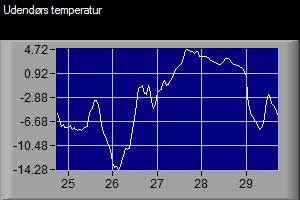 Maybe that's why the plants are sold dirt cheap at 35 DKK apiece (approximately 7 USD or 4.5 EUR). Anyway, I ended up buying 9 plants and even though they are allegedly Lophophora williamsii I'm pretty convinced there's at least one L. diffusa among my plants. 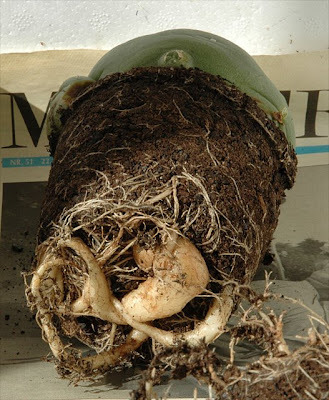 The plants are extremely root-bound and growing in a peat based soil with (what looks like) blackish lava granules in the mix. 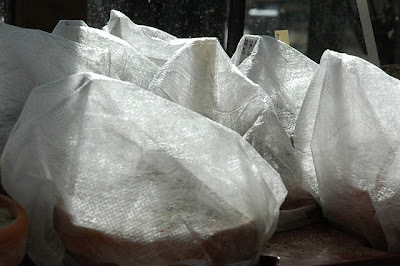 After carefully removing the plants from their pots they were left to dry for a couple of days before being repotted. 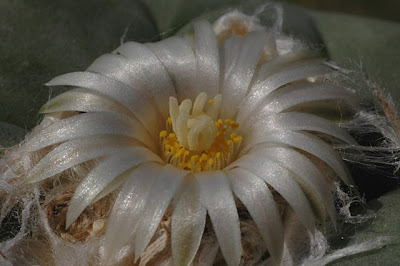 You can see photos of some of the plants flowering in this post. 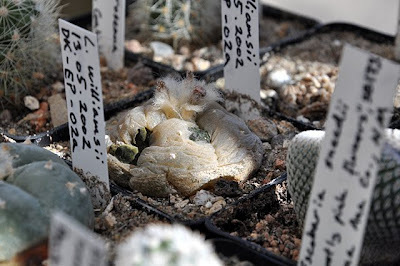 Some time ago Rory contacted me to discuss cacti and mycorrhizal associations (an interesting subject that might be brought up in a later post). 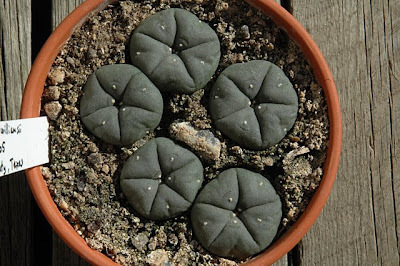 During our conversations Rory revealed himself as an avid Lophophora grower with an impressive collection of mature and well-grown plants. 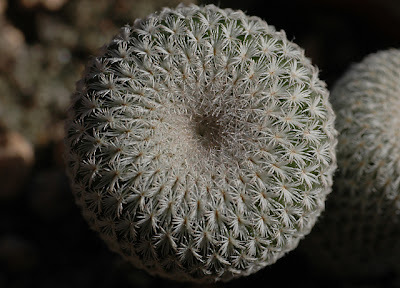 Rory has kindly allowed me to share some pictures of his plants. The largest of the L. williamsii plants in this pot are approximately 25 years old. 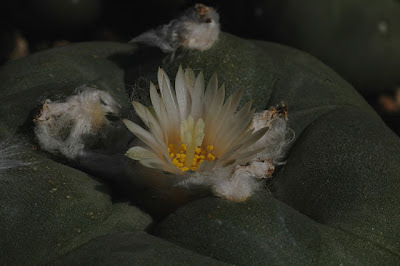 One of the plants in the central group (a bit above and to the left of the center) has been decapitated and set 4 offshoots. One of these has not yet developed a central growing point and appears somewhat cristate, but Rory expects it to develop as normal with time. 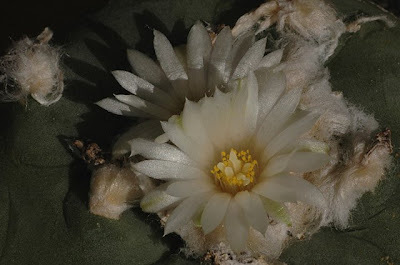 The removed top was rooted and is also growing in the central group of plants (slightly below center; wool removed from areoles), and is flowering regularly. According to Rory the compost used for the L. fricii plants are not drying fast enough. 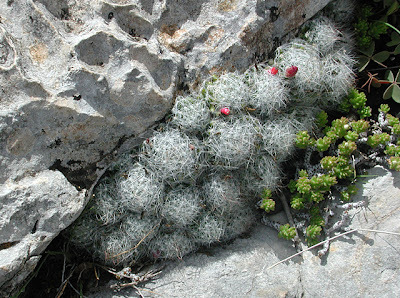 Consequently the plants are kept on the dry side which accounts for the red coloration shown by some of them. 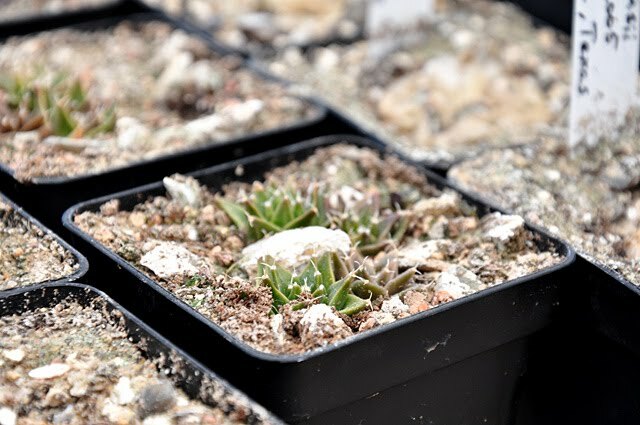 The largest of the plants (with a total of 9 offsets) has only grown 1cm (~0.4'') in the past 9 years so Rory is planning on repotting the plants in a new mix and expects this to speed up growth. The above L. echinata diffusa plant is just about to flower - unfortunately it’s too overcast for the flowers to open properly. 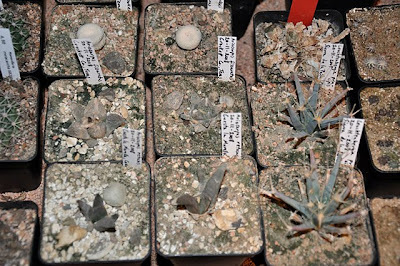 To top things off (or just to make me completely envious ;-) Rory also threw in a photo of a nice, mature Ariocarpus fissuratus specimen. I hope you enjoyed this “guest appearance” - I for one would like to see more of Rory’s plants. 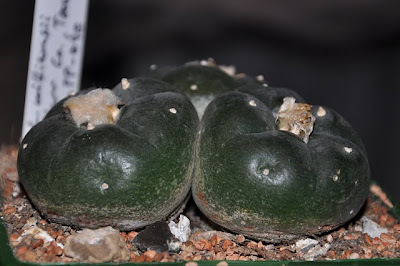 If you have pictures or information you would like to share, you can drop me a mail at “lophophora [dot] blog [at] gmail [dot] com”. 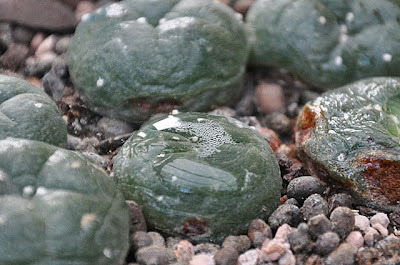 Since 2004 I’ve experimented with growing Lophophora, Epithelantha, and Acharagma in an unheated greenhouse in Denmark. 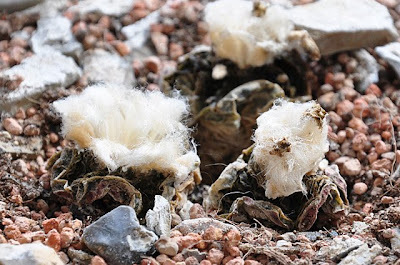 The winter this year has been damp but not very cold - the coldest temperature registered in the coldhouse was -5C (23F) – so even the L. diffusa plants are doing great. The L. williamsii plants (sown May 2004) are thriving in the coldhouse. 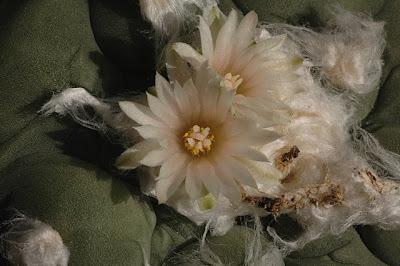 The epidermis is glaucous bluish-green, much truer to the type than plants grown in my windowsill. 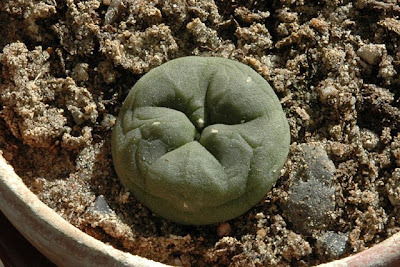 All my cold grown Lophs are wrapped in horticultural fleece during winter – not so much because of the temperature, but to avoid attacks from various critters. 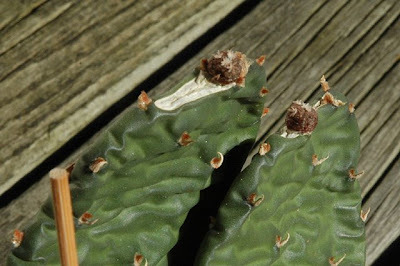 This kind of damage is not a problem with the spine covered species. 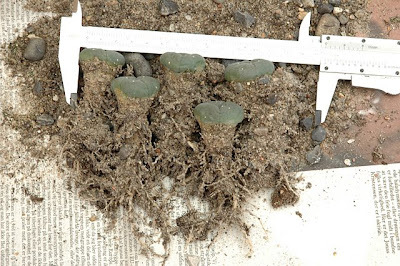 In 2005 I sowed L. diffusa and L. decipiens to grow in the coldhouse. 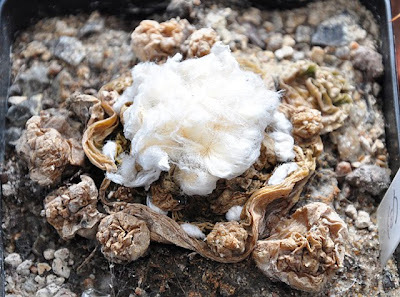 Especially the L. diffusa plants had a hard time last winter and only 2 survived. Both are now doing fine and are developing the typical yellowish-green epidermis. 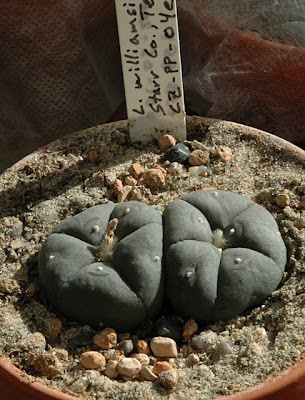 L. decipiens is not a “good” species; it’s probably just a cultivar form of Lophophora fricii (I couldn’t obtain any collection data for these seeds either when I bought them). Anyway, the plants are doing well and are getting ready to go 8-ribbed at an age of two. 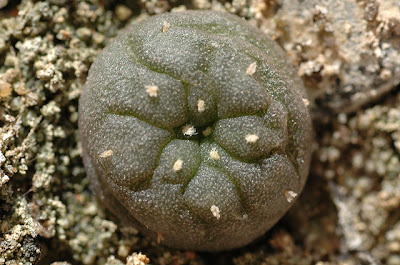 I’m growing both “regular” Epithelantha micromeres and Epithelantha micromeris v. gregii. 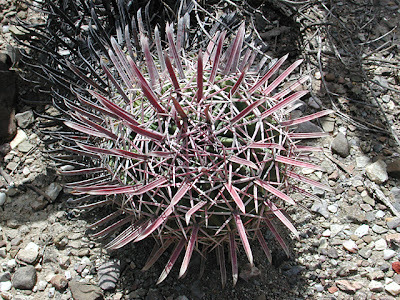 The gregii variety seems to be a faster grower than the regular micromeres; it also has a very beautiful coverage of spines, as illustrated below. 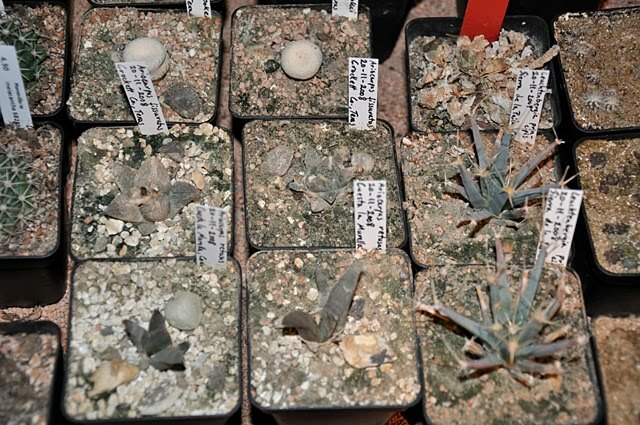 All of the Epithelantha plants made it through this winter without damage.